Our Himalayan hansayoga curriculum (gurukulam) is known by the Sanskrit name Hansayogin. This curriculum is placed fourth among the seven levels of the Teachings tab. This is a natural progression after daily wellness routines are in place. Then a disciplined practice of breathwork and movement led by breathing can be brought about. The curriculum begins by emphasizing the correct practice of ujjāyi breathing (breath of victory), including how to place hands, how to synchronize the lower abdomen during the inhalation and exhalation, and how to experience the subtle movement sensation of prāna (vital energy). The second stage of this curriculum focuses on how the flowing movements linking the intermediate postures are superimposed on the ujjāyi breath. Thus these movements are synchronized with inhalation and exhalation. The goal at this stage is to coordinate a practice of yoga-vinyāsa-krama by harmonizing movements with the ujjāyi breathing. A traditional yoga-nidrā practice is taught to allow deep relaxation through a guided practice of conscious rest. While yoga-nidrā practice brings about quality relaxation by removing emotional disturbances, it is the practice of yoga-vinyāsa that is said to be ideal in removing physical disturbances. The third stage of this curriculum inspires participants to practise prānāyāma breathing techniques in order to enhance their personal wellbeing. Three systems of prānāyāma breathing techniques, viz. the classical yogasutra-based system, traditional haṭhayoga system and nath system of Trayambaknath, are delineated for the aspirants. In yoga-vinyāsa, the movements are led by the breath. This is the original style of yoga practice that integrates the prānāyāma stage into the āsana (steady posture) practice. The order that unfolds into a coordinated series is called the krama. 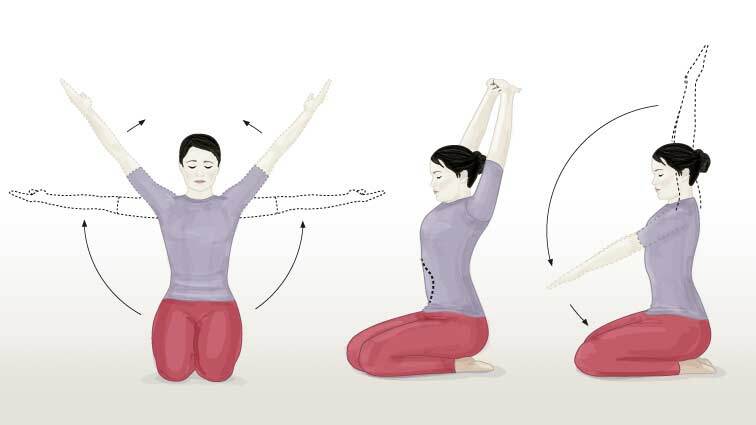 This sequence contains the intermediate steps of āsana postures as defining the vinyāsa of the principal āsana. Herein one can think of vinyāsa as literally “one movement into the next” while krama implies “placed in a certain order.” Those intermediate steps are also individual āsana but linked with pauses in the breath to structure the flow into a complete sequence of the principal āsana to which the whole vinyāsa is ascribed. Hence an appropriate name for this style or approach to aṣtānga–yoga (well-known eight-limbed yoga of sage Patañjali) is yoga-vinyāsa-krama. The emotional disturbances and physical disturbances are deemed to be fundamental obstructions in the path of meditation and this is why the five restraints (yama) and five observances (niyama) have been listed as the ‘ten commandments’ for the first two stages of the eight limbs of yoga. These ten vows (sārvabhouma-mahāvratam) then make way for the yoga-nidrā and yoga-vinyāsa related to the next two stages of āsana and prānāyāma of aṣtānga-yoga (eight-limbed yoga). While practising the basic techniques of yoga-vinyāsa-krama, the breath will rarely become laboured and the pulse rate will not race. Aerobic exercises have their place in building fitness and strengthening the cardiovascular system, but this form of yoga is designed to bring down the breathing rate and reduce the heart rate thus increasing sāttwika tendencies of calmness. This calmness becomes invaluable in developing samāpatti (habitual engrossment upon the object of meditation due to the momentum of practice), thereby allowing mindfulness and steadiness to grip the meditator. Ramaswami, Srivatsa. Yoga for the Three Stages of Life. Rochester: Inner Traditions, 2000. Satyananda Saraswati, Swami. Yoga Nidra. 6th ed. Munger: Yoga Publications Trust, 2009. Ramaswami, Srivatsa. The Complete Book of Vinyasa Yoga. Boston: Da Capo Press, 2005. This comprehensive 240-page workbook inspires seekers to lead a balanced lifestyle with practical guidelines on how to restore wellness and enhance vitality. Yoga philosophy places breathing as the bridge between the tangible and the intangible, at the cusp of the physical and the subtle.